I woke up Friday morning I saw a tweet about traveler and chef Anthony Bourdain written in the past tense. I couldn't figure out why. Until I read further. I couldn't believe it. I still can't. Later that same day I drove to Louisiana to participate in the ordination of a colleague. As I drove through Texarkana, the local NPR station aired an interview with Anthony Bourdain on Fresh Air from a couple of years ago. I began to sense a need to speak this morning about the spiritual issues related to suicide. We'll resume our series on the Israelite monarchy next Sunday. A few days before Bourdain, the fashion designer Kate Spade also took her life. Both Spade and Bourdain were parents of pre-teen children. We offer our prayers of comfort and presence to their families and loved ones. These two deaths have raised awareness of the painful reality of suicide. Many celebrities on Twitter posted the suicide prevention phone number and urged people to seek help when they feel despair. Others on Twitter used these heartbreaking tragedies to further their own agendas or spread harmful, and false, doctrines about a theology of suicide. The stigmas associated with suicide must be called out and refuted. Celebrities and wealthy people do not have things any easier that anyone else; if you think fame and riches equate to happiness and peace of mind, you are wrong. Life impacts everyone. So why are we talking about this in church? Well, as I have said before, the church is a family. It is a place where we offer support and encourage one another. Honestly, the church tends to look the other way on difficult issues like suicide; so discussing things openly can challenge stigmas and the urge to respond with lowered heads and silence. We may experience suicide as a community at some point. There may be individuals who have lost a loved one to suicide and they have lingering questions. Or people may be wondering what to/signs to look for/words to share. The best response to bad theology is good theology. And there is plenty of bad theology out there about suicide. First, let's deal with the harsh reality: suicide is a massive issue in America. Nevada's suicide rate is disproportionately higher than the other states, and remained unchanged. 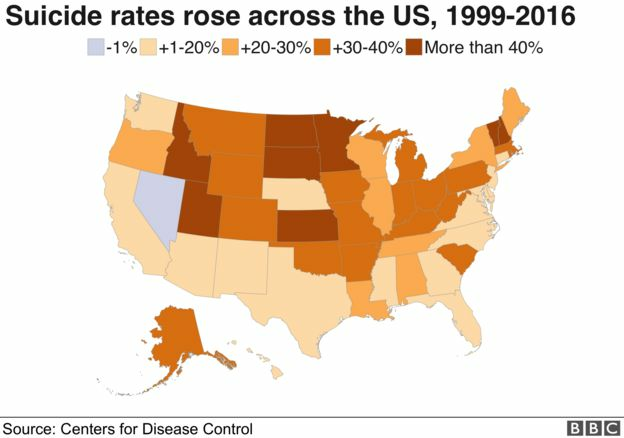 In 17 years, 30%: That's how much the overall suicide rate has increased in more than half of US states, according to the US Centers for Disease Control and Prevention (CDC). The overall rise nationwide is about 25%. It means that around 16 out of every 100,000 Americans will take their own life. Nearly 45,000 Americans took their own life in 2016 alone. According to CDC data, suicide increased among all sexes, ages, races and ethnic groups. Fifty-four percent of decedents in 27 states in 2015 did not have a known mental health condition. Suicide is the tenth leading cause of death, and only one of three causes of death on the rise (drug overdose and Alzheimer's are the others). Suicide is rarely caused by any single factor, but rather, is determined by multiple factors. Despite this call to action, suicide prevention largely focuses on identifying and referring suicidal persons to mental health treatment and preventing reattempts. In addition to mental health conditions and prior suicide attempts, other contributing circumstances include social and economic problems, access to lethal means (e.g., substances, firearms) among persons at risk, and poor coping and problem-solving skills. Common contributing factors to suicide in 2015 also include: a relationship problem (42 percent), a recent or upcoming crisis (29 percent), substance abuse (28 precent), a physical health problem (22 percent), and a job or financial problem (16 percent). Two thirds of suicide decedents with mental health conditions had a history of treatment for mental health or substance use disorders, with approximately half in treatment when they died. The World Health Organization reports ~800,000 suicide deaths worldwide each year. As of 2018, only 10 states mandate suicide prevention training for health professionals. The vast majority of deaths from firearms are suicides. In fact, two-thirds of gun-related deaths in America are suicides, according to the CDC. Firearm access is a risk factor for suicide in the United States. Individuals who own firearms are not more likely than others to have a mental disorder or have attempted suicide. Rather, the risk of a suicide death is higher among this population because individuals who attempt suicide by using firearms are more likely to die in their attempts than those who use less lethal methods. Other groups identified as having a higher risk for suicidal thoughts and/or behaviors than the general population include LGBT populations and individuals who have been bereaved by suicide. The suicide rate among middle-age and older adult Veterans remains high. In 2014, approximately 65 percent of all Veterans who died by suicide were age 50 or older. Risk for suicide was 22 percent higher among Veterans when compared to U.S. non-Veteran adults. What does the United Methodist Church say about suicide? We believe that suicide is not the way a human life should end. Often suicide is the result of untreated depression, or untreated pain and suffering. The church has an obligation to see that all persons have access to needed pastoral and medical care and therapy in those circumstances that lead to loss of self-worth, suicidal despair, and/or the desire to seek physician-assisted suicide. We encourage the church to provide education to address the biblical, theological, social, and ethical issues related to death and dying, including suicide. United Methodist theological seminary courses should also focus on issues of death and dying, including suicide. We believe God's grace is more powerful than death, and we affirm Christ's authority over the living and the dead. That means Christ's grace has the power to extend to all, and that God has ultimate say over human life. Mental illness is a reality many face;; despair can afflict any purpose at any time. So it's vitally important to the surviving families to be very clear that God is a God of life, not death, and that through the resurrection of Jesus Christ death lost its power over humanity forever. The idea that people who kill themselves are sentenced to Purgatory, a dubious theological concept with no scriptural support whatsoever, is not something United Methodists believe. There is no halfway house where our souls are sent to wait for some act of penance by a living relative before we are set free. Nor is a person who takes their life condemned to hell. 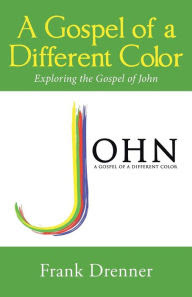 Recently at Conference a visiting bishop said, "We all know John 3:16: 'God so loved the world that he gave his only Son, so that everyone who believes in him will not perish but have eternal life.' But we forget John 3:17: 'God didn't send the Son into the world to condemn the world, but that the world might be saved through him.'" The notion that God would punish a person who obviously found their earthly life unbearable-- regardless of illness-- is antithetical to the God of love and grace we know in Jesus Christ. When Judas, his betrayer, saw that Jesus was condemned, he repented and brought back the thirty pieces of silver to the chief priests and the elders. He said, ‘I have sinned by betraying innocent blood.’ But they said, ‘What is that to us? See to it yourself.’ Throwing down the pieces of silver in the temple, he departed; and he went and hanged himself (Matthew 27:3-5). When they had finished breakfast, Jesus said to Simon Peter, ‘Simon son of John, do you love me more than these?’ He said to him, ‘Yes, Lord; you know that I love you.’ Jesus said to him, ‘Feed my lambs.’ A second time he said to him, ‘Simon son of John, do you love me?’ He said to him, ‘Yes, Lord; you know that I love you.’ Jesus said to him, ‘Tend my sheep.’ He said to him the third time, ‘Simon son of John, do you love me?’ Peter felt hurt because he said to him the third time, ‘Do you love me?’ And he said to him, ‘Lord, you know everything; you know that I love you.’ Jesus said to him, ‘Feed my sheep...‘Follow me’ (John 21:15-17, 19b). Peter experiences forgiveness and redemption, a restoration of purpose, in that interchange with Jesus by the Sea of Galilee. There is every reason to believe the same Jesus who sought and redeemed a wounded Peter would have done the same for Judas. It is in the very heart of God to seek out and save the lost. Families of those who take their lives need extra attention and care. Compassion and a ministry of loving presence can be a great comfort to the grieving. Death, especially suicide, can be very isolating for survivors. One of the scenes describing Jesus' death on the Cross involves his mother and one of his followers. Facing his own death, he speaks to his mother. Referring to the disciple, he says to her, "Here is your son." Then, speaking to the disciple, Jesus gestures to his mother. "Here is your mother." The narrator closes the scene: "From then on, the disciple took her into his own home" (John 19:27). We learn that even in the midst of profound suffering, there is a possibility for new life in community. Death and grief are powerful forces to confront, and we are stronger within our relationships to each other than when we grieve alone. -and then leave me to do the same? Why couldn't she share her anguish? that it is our fault. we simply cannot bear it. and how terribly we will miss her. Help us cope with this unbearable pain. May his suffering not be in vain. may it be transformed into good. in the furnace of your love. Not just a cooking or travel show, Parts Unknown is an exploration of other cultures. Different people and locations are not treated as strange; they are respected. 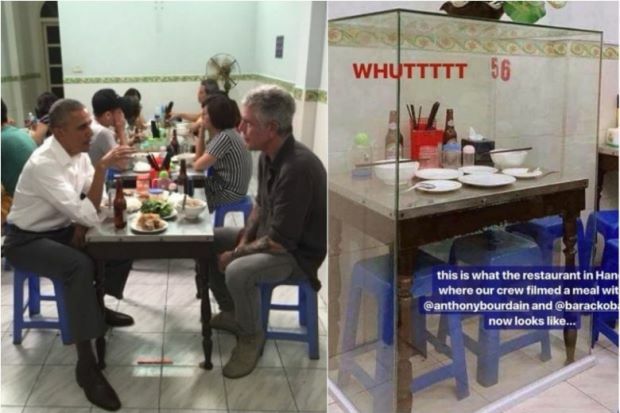 It's easy to see how Bourdain is invited in to the community as an equal. Over this weekend, I can't count how many tweets I have read about Anthony Bourdain from people from other ethnicities and traditions. They felt his respect for them, his need to learn from them, but also his desire to be with them. And maybe that's a great lesson for us when dealing with those who are at risk of suicide, or grieving the loss of one who ends their life. Sharing lives. Building relationships. Creating safe community. In a world becoming more and more isolated, the best way to keep people from despair is to be with them. Both Bourdain and Kate Spade were alone when they died. End the stigma about seeking help. It is not a sign of weakness. End the stigma around mental challenges. There are many different professional treatment options. But it's important to remember: only half of suicides in America have anything to do with mental illness. Depression or other illnesses are not automatic triggers for suicide. There are many other factors. I'll close with a couple of wonderful texts that assure all of us of God's great love, and challenge us to bear that love of God for others. Beloved, let us love one another, because love is from God; everyone who loves is born of God and knows God. Whoever does not love does not know God, for God is love. God’s love was revealed among us in this way: God sent his only Son into the world so that we might live through him. In this is love, not that we loved God but that he loved us and sent his Son to be the atoning sacrifice for our sins. Beloved, since God loved us so much, we also ought to love one another. God is love, and those who abide in love abide in God, and God abides in them. Love has been perfected among us in this: that we may have boldness on the day of judgment, because as he is, so are we in this world. There is no fear in love, but perfect love casts out fear; for fear has to do with punishment, and whoever fears has not reached perfection in love. We love because he first loved us. If we live, we live for the Lord; and if we die, we die for the Lord. So, whether we live or die, we belong to the Lord (Romans 14:8). The more of these signs a person shows, the greater the risk of suicide. Warning signs are associated with suicide but may not be what causes a suicide.